Get more Google and Yelp reviews by including links in your follow up emails to clients. You can also hyperlink your badges for reviews. Customize client follow up emails with review links to get more Google and Yelp reviews. 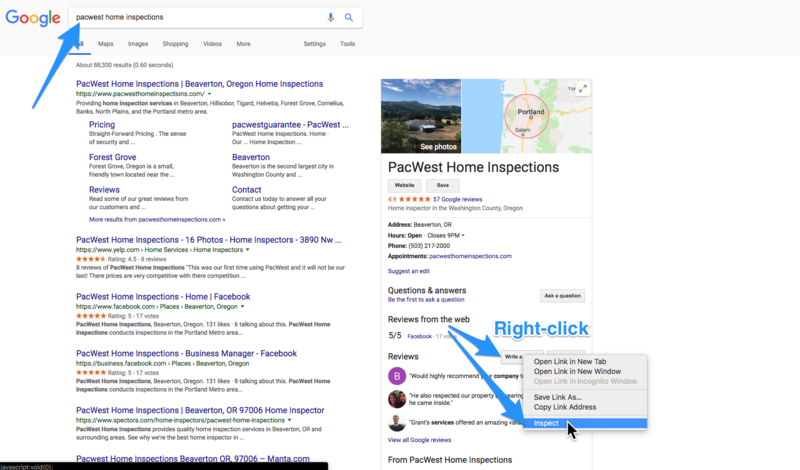 Make sure you put your review links in the post-inspection follow up emails found in Automation>Post-Inspection:Client (and Client's Agent if you're asking Agents for reviews). 1) Type your business name (for some you might have to also include your city/state) into Google. Your Google my Business account should show up on the right side. 2) Right-click the "Write a review" button and click "Inspect" (It's Inspect Element in some browsers). 3) Copy and paste the numbers and letters inside the " ". 5) Now copy and paste this link and add it to your Spectora automated follow-up emails! Go to your Yelp account and click "Write a Review", copy the url, and paste into your follow-up emails! *You also have the option to hyperlink that "Write A Review" into an image or badge. Once the image is uploaded and selected, go ahead and click the "link" icon and paste the URL. Follow the link below for a quick 10 second video walk-through on how to add an image and link it.